Part Martin Scorsese, part Frank Capra, David O. Russell’s Silver Linings Playbook can be best described as a gritty fairytale. Following The Fighter, Russell continues his exploration of middle class communal living, exchanging boxing gloves for dance shoes. Russell impressed me with the romantic glimpses on display in The Fighter between Amy Adams and Mark Wahlberg, but that element of the picture was overshadowed by a scenery-chewing performance from Christian Bale. With Silver Linings Playbook, a remarkable balance is achieved as Russell constructs a picture centering on romance and the toils of coping with mental illness. Never bogged down in depression nor ever registering false on sentiment, Silver Linings Playbook possesses an aura of lighthearted sophistication that far exceeded expectations. 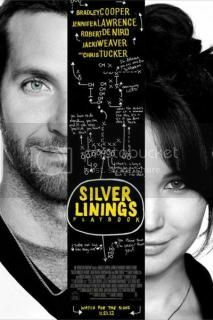 Despite opening in a mental institution, much of the first act of Silver Linings Playbook bypasses mental illness in exchange for whimsical humor. In Bradley Cooper, Robert De Niro, and Jacki Weaver, Russell simply attempts to convey the supportive familial bonds on display. Despite a series of tumultuous events that prompted a nervous breakdown in Cooper’s character, the support that he finds in family is something that is palpable throughout the picture. It’s in a crucial scene, where Cooper’s character attempts to retrieve his wedding video, does Russell lay on the emotional strain found in mental illness. Using Led Zeppelin’s What Is and What Should Never Be, Russell finds a striking balance between his imagery and musical choices. Much like The Fighter, Russell makes some very unconventional and frankly bold musical selections that help shape the feel of the film. It’s in the central romance between Jennifer Lawrence and Bradley Cooper that Silver Linings Playbook really become a picture of emotional complexity. Plagued with death and emotional insecurities, their characters have an authenticity that makes Silver Linings Playbook come off as incredibly infectious. Balance for authenticity is crucial to what makes their relationship so remarkably poignant, as gritty aspects of their past coalesce with a fairytale-esque dance competition that brings the couple together. Writing about the film now, reflecting the tiny moments that Russell is able to capture between the pair, leaves me with a smile that’s impossible to shake. Silver Linings Playbook succeeds for capturing an optimistic spirit. Whereas so many pictures this year may possess the polish of formal finesse or bold musings on the nature of contemporary society, Russell’s film is a traditional picture that fits perhaps a less ambitious thematic thesis. It’s a film about rejecting cynicism and embracing hopefulness. Some will undoubtedly consider the picture slight, particularly given that it is a more effective piece to be viewed from an actor’s and writer’s sense. But the emotional scale of Silver Linings Playbook, from its ability to mine for such grand emotional truths without jeopardizing its grounded human qualities, makes the film a personal success – it’s a film that I can hold on to for what it speaks to me on a personal level.